Furthermore, a 2017 survey by the CFA Institute found that 73% of responding portfolio managers and research analysts take ESG issues into account in their investment analysis and decisions. Out of this group, the majority integrates ESG systematically into the whole investment analysis and decision-making process. In addition, the UK’s Department for Work and Pensions recently introduced new regulations for pension funds due to come into place from October 2019. In order to be compliant, trustees who disregard the long-term financial risks or opportunities from ESG will then have to justify why this does not hurt their investment returns. Boards of Directors are trusted to run the company in the best interest of their shareholders. 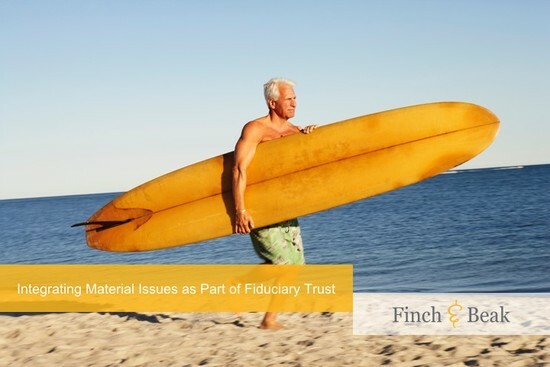 This trust is often referred to as the fiduciary trust; the legal obligation of one party to act in the best interest of another. The duty-bound party is a fiduciary that is entrusted with the care of the owners’ assets. Over the past decade, the notion that this requires the Board of Directors to focus on the direct shareholders’ interests has slowly eroded. Shareholders and providers of financial capital have been identified as one of several stakeholders to the company. With the use of the different forms of capital in the International Integrated Reporting Framework (financial, manufactured, intellectual, human, social and relationship, and natural capital) different stakeholders with different interests emerge. A solid materiality assessment presents a balanced view on various stakeholders’ interests – investors and others – matched against business impact. Positively or negatively impacting these interests could have a big influence on the long-term shareholder value of the company. In the view of the European Commission, clarification and thereby emphasis of these fiduciary duties and sustainability could motivate investors to allocate capital more efficiently. This implies a shift towards a longer-term perspective on sustainability risks and opportunities, rather than simply seeking to maximize short-term financial returns. In a 2017 research under WBCSD members' reporting, discussions and surveys with risk management and sustainability practitioners indicated that most practitioners (89%) agreed that sustainability risks could contain a significant impact on business. At the same time, more than 70% of the practitioners claimed that “risk management practices are not adequately addressing sustainability risks”. The Mixed-up Chameleon Complexity: Material issues do not stop at the company’s back door. Or at the front door, for that matter. 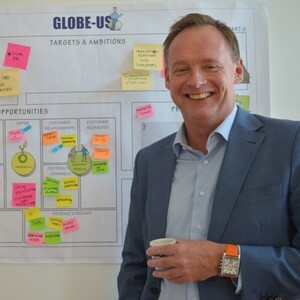 But to what degree do companies adjust their sustainability material topics to their value chain partners? Service industries such as consultancies and banks are probable candidates to focus on the material issues within their client portfolio than on their own (relatively small) footprint. With a potentially very diverse client base, the range of material topics that need to be addressed can become huge. The Geography Complexity: As definitions of material issues might differ per region, global businesses have an extra challenge compared to regional companies. An example of a sensible way of dealing with this can be found in the dairy sector. In total, the Dairy Sustainability Framework includes 11 global criteria such as waste, water and greenhouse gas emissions. These criteria are allowed to be interpreted differently across 11 regions around the globe, enabling a prioritization of the issues relevant to the region, while connecting them at a worldwide level. The Hodgepodge Complexity: Similar to private equity firms, conglomerates with a broad array of portfolio businesses have a corresponding display of material topics. This diversity makes the vectoring of sustainability efforts hard, if not, impossible. In the absence of one central business that is driving materiality, much is left to the individual portfolio businesses. Decentralized business is leading to decentralized sustainability, but this is creating extra complexity for reporting and it can stand in the way of implementation on a transformational level. This article is based upon Winning Sustainability Strategies (Palgrave 2018, Leleux and Van der Kaaij, forthcoming). Presenting numerous award-winning cases from IMD business school and examples from companies such as Unilever, Patagonia, Tumi, DSM and Umicore alongside original ideas based upon 20 years of consulting experience, this book reveals how to design and implement a stronger sense of focus and move sustainability programs forward. This proven combination of purpose, direction and speed is dubbed Vectoring. In Winning Sustainability Strategies, the requirement for a clear direction and strong execution is described as the Vectoring of sustainability strategies in 14 chapters. Each chapter contains recent research data, in-depth case studies from companies such as Unilever, Solvay and DSM and practical, downloadable tools. If you would like to learn more about Winning Sustainability Strategies send a mail to Nikkie Vinke via nikkie@finchandbeak.com or give her a call at +31 6 28 02 18 80. Make sure you are subscribed to our newsletter in order to receive all book-related updates.